In the wild, rabbits live in large social groups, and this socialisation is a key part of their make-up. Research has proven that rabbits suffer from stress when kept alone and without the companionship of at least one other rabbit. Domestic rabbits should be neutered and kept in pairs (opposite sexes work best) or in compatible groups. Rabbits are also athletic animals, and in the wild they would cover an area of 4 tennis courts each day. They need to be able to run, jump, dig and forage every day to keep them happy and healthy. Rabbits who are confined to hutches develop painful spinal deformities, which are a problem in themselves, but also make the rabbits difficult to handle, which can result in injuries to both the rabbits and owners. Both indoor and outdoor rabbits need a good deal of space. They must be provided with a large shelter (hutch) and permanent access to a large safe exercise area (run). 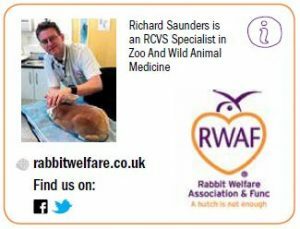 The RWAF recommendation is a 6x2x2ft hutch and attached run of 8x4ft as a minimum, giving and over all area of 10ft x 6ft x 3 ft high. Rabbits need unlimited access to clean hay or grass, not only to prevent boredom, but also to keep their teeth and guts healthy. The specific chewing action when eating hay causes the teeth to wear down naturally and prevents serious dental problems which are often suffered by pet rabbits with an inadequate diet and a bunny who is chewing hay all day is not going to be bored. 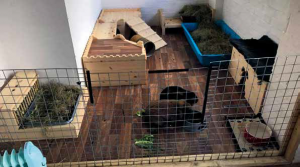 At this time of year it is especially important that you keep a close eye on your rabbit(s) and make sure they have a covered and dry area in their run, plenty of fresh water, and lots of clean dry bedding. 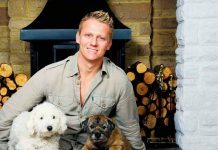 Consider moving the hutch and run closer to the house so that you can see them more often and more easily, or think about putting them in a garden shed to provide extra protection. This advice is for rabbits who are in good body condition. Those who are old or thin may need even more care and we advise owners of such bunnies to discuss with their vet and bring them inside for the winter. Put old blankets or duvets over the hutch and run, but under the tarp for extra insulation. (Make sure the bunnies can not nibble any of it). Add a low wattage heater to a shed, but make sure the rabbits can’t chew the cable! Make sure bedding is kept warm and dry. Straw is warmer than hay so makes a better bedding, but nothing is warm if it’s wet. Your cleaning schedule needs to be scrupulous in the winter and don’t be stingy – make sure you provide a deep bedding of something like shavings or Megazorb under the straw. 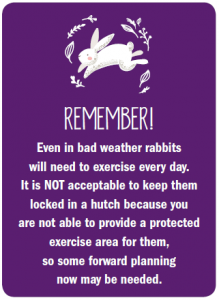 A hutch attached to a safe exercise run means that rabbits can shelter in the hutch or exercise in the run when they please. At the very least add a tarpaulin cover to protect them from the rain and snow, and add a hiding place (one per bunny). very dangerous) or a conservatory. Lots of owners bring their rabbits in and keep them as house rabbits over the winter months. It’s fine to winter house rabbits and summer garden rabbits, as long as you do not embark on this and then abandon it mid-way: if you decide to do it, you will have to stick with it because it would be cruel to bring them in and let them moult their winter coat, only to put them outdoors again before spring. 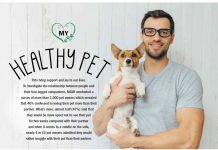 If you are going to do this then first of all bring them into a room with no heating and acclimatise them gradually. Remember that they may find household noises like the TV and washing machine scary so take your time. They will not be used to the artificial lights and extra ‘daylight’ either so make sure they have somewhere to hide out while they adjust. 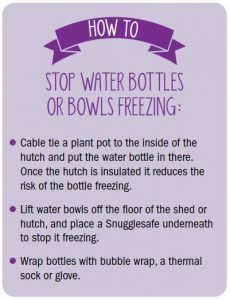 When to take action: By cold we mean if the temperature falls below zero; that is when insulating hutches and sheds and items such as Snugglesafe can be used for best effect – but of course lots of the tips relate to weather proofing and they can be used in wet and windy weather regardless of the temperature.